Stafford Physiotherapy and Pilates' onsite Pilates studio was launched in 2012 so that we could offer our clients the many benefits of Pilates under the expert guidance of a physiotherapist. Following private health reforms in early 2019, we updated the name of our Pilates classes to 'physiotherapy exercise sessions' to allow our patients to continue to claim through their private health cover. Most private health funds will offer a rebate for our physiotherapy exercise sessions, including the initial musculoskeletal assessment and private follow-up session, under ‘Physiotherapy’ extras cover. Click here for more information on these sessions. In addition to physiotherapy exercise sessions, we will soon be offering small reformer Pilates classes. Please contact us to express your interest and we'll keep you updated. You don’t need to be an existing physiotherapy client to attend our classes; many of our clients attend our classes purely for the fitness-related benefits. Our Pilates classes and physiotherapy exercise sessions are all supervised by a physiotherapist, with a maximum of 4 people per class. This allows your physiotherapist to tailor your program during class to suit your immediate needs, which is particularly beneficial should you have a flare up of an injury or a new problem. Pilates is a series of controlled exercises that can be very gentle or physically demanding (or somewhere in the middle). It is suitable for all ages and stages of rehabilitation and fitness, as we prepare a fully-personalised program for each client. 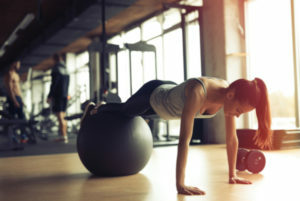 Not only is Pilates a valuable step in injury rehabilitation, but it can also help to build strength and prevent future injury in otherwise healthy people. Please contact us if you’d like to know how Pilates could help you. Our Pilates studio features the well-known reformer machines, as well as lesser-known large equipment including the wunda chair, ladder barrel and trapeze table. Programs will generally also incorporate small equipment like the spine corrector, magic circle, balls, weights, mats (for floor work) and foam rollers.